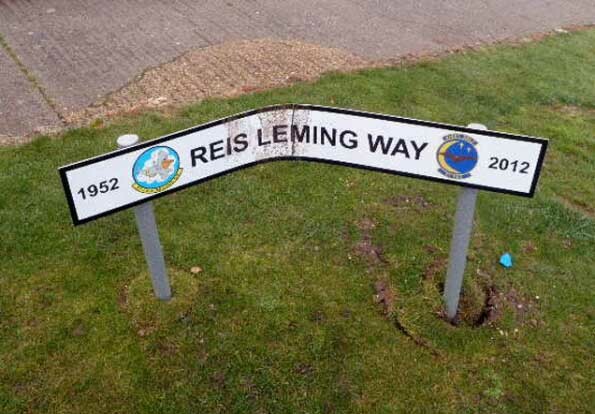 I read with discust the damage to the Reis Leming sign in Hunstanton.What kind of idiot is reponsible,Do he or they realise that man saved 27 people'from certain death and himself was given up for dead,not bad for a man who could'nt swim ,It's pretty obvious that life has no meaning to scum like this.I just hope that when his wife visit's the area later this month she is oblivious to this despicable act. act when others do not. This is the damage the morons did. Can anyone tell me why it says 1952 ...2012? I just realised today there was something wrong with date's,but you beat me to it.Must surely be 1953--2013,the 60 th anniversary falling on the 31 st of this month.Hope they notice before the sign is replaced.